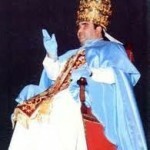 Clemente Domínguez sitting in the gestatorial chair. 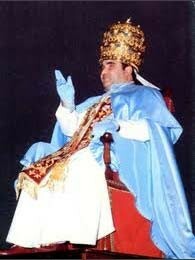 The “seer” of Palmar de Troya proclaimed himself pope, in 1978, under the name of Gregory XVII. “If one asked a connoisseur of Medjugorje what the two most characteristic and recurring expressions in the messages of the Gospa are, he would certainly answer this way: the threefold exhortation “Pray, pray, pray”, and the thanks the Madonna usually addresses to the faithful, with the formula “Thank you for having responded to my call”.